Cape Town - Cape Town City chairperson John Comitis is excited by the form shown by new signing Ayanda Patosi. Patosi was snapped up by the Citizens after his contract with Belgian side Lokeren ran out at the end of last season, and has hit the ground running with two goals in as many starts for the Capetonians. "Ayanda has settled in nicely and that is what we were looking for when we acquired his services," Comitis was quoted by The Citizen on Friday. "There is more to come from Ayanda and for me he needs to make sure he ends up in the Bafana Bafana squad for the World Cup," said Comitis. "My gut feeling is that he will not last for three years because he is probably going to be hungry to go to Europe again and that would be acceptable. "But at the same time, we need to make sure that he is contributing to the silverware that we are challenging for and I think the way he started he is showing us that he is up for it." 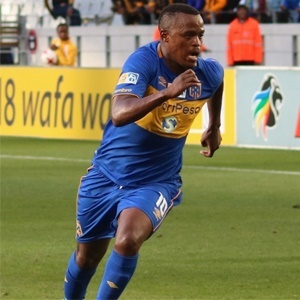 With Lebogang Manyama's exit from the club now confirmed, coach Benni McCarthy will most likely look to Patosi to be the club's main man in attack. Patosi was not included in the Bafana squad that travelled to Cape Verde for a 2018 World Cup qualifier.